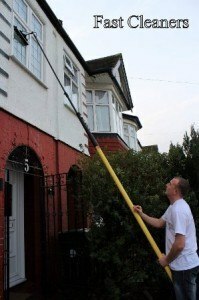 Window cleaning often requires hiring a separate company to come do the job, not when you hire Fast Cleaners Barnet. We will come clean your home or business and do your windows too. In fact, if you only need someone to come clean your windows, we can do that too. Our window cleaners will reach any window or glass you need cleaned without ladders or scaffolding. We use a system that utilizes extendable poles with a water supply. We can reach windows on the sixth floor of your building without any trouble at all. Our cleaners will remain safely on the ground at all times. In addition, our cleaning company only uses environmentally safe window cleaning solutions. If you have children or pets that regularly press against the windows to look out, you will not have to worry about the cleanser harming them. Our cleaners will clean the glass, leaving it clear and streak-free, with no harsh chemicals that may damage the frames or drip onto the paint or siding. Getting glass clean, and not cloudy or streaky, takes experience. You want your home or business to look great from the outside as well as inside. Having dirty windows can make everything else look dirty too. Make your house gleam and shine; have the windows cleaned professionally. Don’t even think, just call us on 020 3322 8598. You can also book and check our other cleaning services that are offered at cheap cleaning prices.